(Nanowerk News) A simple one-step process that produces both n-type and p-type doping of large-area graphene surfaces could facilitate use of the promising material for future electronic devices. The doping technique can also be used to increase conductivity in graphene nanoribbons used for interconnects. 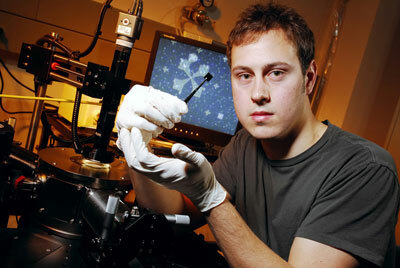 Graduate student Kevin Brenner holds a fabricated graphene sample. A paper describing the technique appears this week in the journal Applied Physics Letters. The research was supported by the Semiconductor Research Corporation and the Defense Advanced Research Projects Agency (DARPA) through the Interconnect Focus Center. In the new single-step process for graphene, the doping is believed to introduce atoms of hydrogen and oxygen in the vicinity of the carbon lattice. The oxygen and hydrogen don’t replace carbon atoms, but instead occupy locations atop the lattice structure. For the future, they’d like to better understand how the process works and whether other polymers might provide better results.